Is Alexa Relevant in 2010? Which has over a million pages indexed in Google! Many of them have Ask.com answers in them, which scrapes questions and answers from across the web and wraps them in ads. 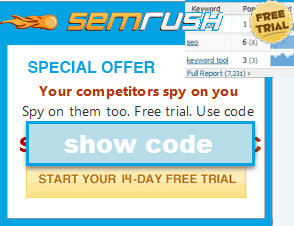 And some of the search results have multiple lead generation boxes on them (without any disclosure). 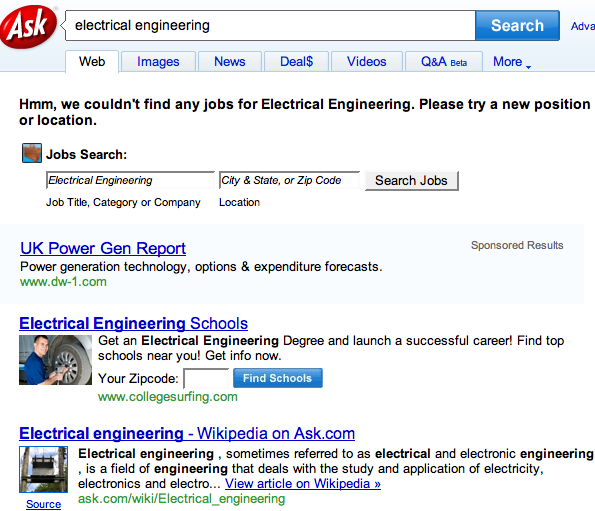 A good chunk of them have Wikipedia listed, but wrapped in ads & hosted by Ask. A few more vertical ad types and/or general purpose web services (to complement answers, news, local, lead generation, Wikipedia, FreeBases, PPC ads) and a search engine would have no need to send searchers anywhere but to advertisers and itself. I have no doubt that Ask's search results monetize at a higher rate than Google's, but that aggressive monetization also costs them marketshare. It is a trade off every business faces: maximizing short term yield, while keeping the business healthy and growing in the market. Given that Google has been testing lead generation AdWords ads, pushing maps hard (while testing ads in the maps results - along with beta tests in big money categories like hotels), paid inclusion in their product search, and product images in the organic search results ... it wouldn't be surprising to see Google clone whatever looks like it is working good for Ask. But Google will have to move slower on many of these fronts, because if they move too quickly they won't be able to defuse the blowback and anti-trust concerns. Given their recent user privacy snafu, and the current brand ad push where they are now trying to promote the categories they once claimed to have hate, the last thing they want to do is give people more reasons to distrust them and give regulators more reasons to give them another look. So new features launch as a limited beta test / experiment to a subset of users (and in many cases free to advertisers) to slowly release their business plans in a way that does not create too much concern. Small steps bring limited regulatory interference, and by the time concerns are voiced they can say "we have done that for years." But as the Microsoft (or Wal-Mart) of the web, I wonder if it is a good idea for Google to make blog posts with titles like Now it's easy to switch to Google Apps from Microsoft® Exchange. The broader they spread search, the more likely they are to find their words working against them at some point. They can't claim to be agnostic while self serving ads and writing how to guides on switching away from competitors. Not sure what that comment is supposed to mean. I don't get it. I just meant that the move seems a little Mahalo"ish". Stealing/using other people's content and throwing ads in the mix. Ask does a good job of clearly saying where the content comes from, but it still seems a little desperate and shady. It's an interesting move but not at all surprising. I don't know if I'd categorize them as leading the charge in this movement. Most of my product searches these days end up with a dozen or so shopping sites showing their search results pages (shopping.com, dealtime.com, etc). 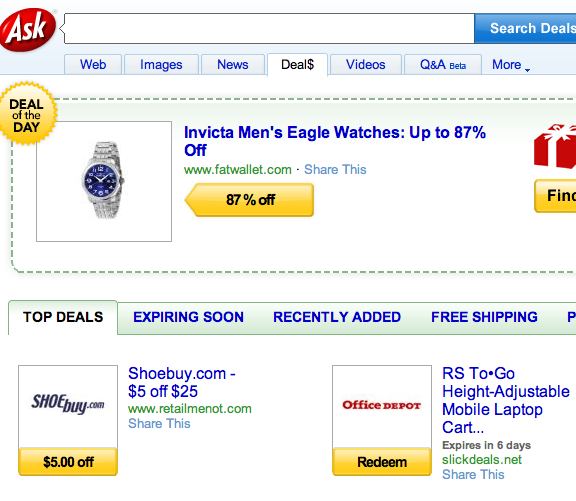 Ebay has spammed their results with their millions of subdomains too. I just think we're seeing it more and more as people realize that it's much easier to leach off Google's traffic than it is to build their own. I will admit that I'm surprised that Google has allowed so much of this stuff to proliferate their search engine. I don't know what it does for the user experience if you search for a "red widget" and get a page full of results that take you to search results on another site for "red widgets". Just seems to be adding another middle man to the equation. Although many of these sites syndicate Google ads so perhaps they view it as a second chance to make some income off a particular search. Not a fan of conspiracy theories as I believe these sites rank based on their massive link profiles, but I do have to wonder if a few of these spammier sites that just provide more search results (shopping.com, mahalo.com, etc) would be nerfed if they weren't running ads by Google. InterActiveCorp to Acquire Ask Jeeves? Ask Jeeves Interview, Search Stocks Falter, When is it OK to Start Selling SEO Services?